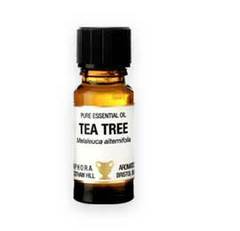 Tea Tree Essential Oil. It is 11 to 13 times as strong as carbolic acid. This oil has been extensively used by the Australian aboriginal people for centuries. Scientific research has found it effective against bacteria, fungi and viruses. DILUTE TO 5% OR LESS IN CARRIER OIL BEFORE SKIN APPLICATION.